According to the Associated Press, a 15-year-old has been charged as an adult for attempted first-degree murder in a shooting a classmate on the first day of classes at a Baltimore County high school, authorities said on August 28, 2012. The teen used a double-barreled shotgun. He took the gun from his father’s house and drank vodka before the shooting. The teen allegedly wounded a 17-year-old classmate before being rushed by faculty. The teen was also charged with first-degree assault and was being held without bail at the Baltimore County Detention Center, Baltimore County law enforcement said. Classes resumed at Perry Hall High School with a police presence. Around 150 students showed up for a prayer vigil organized by local churches on the grounds of the school. The vigil assisted to calm students dealing with the shooting. The teen’s father spoke to a reporter at his home and said his son had been bullied. The state’s attorney’s office did not know if the teen had legal representation. Police plan to hold a news conference. The victim remained in critical condition at Maryland Shock Trauma Center, a hospital spokeswoman stated. Attempted murder and assault, like other criminal cases, goes through a difficult criminal defense timeline. The criminal proceedings in Maryland include the following stages: arrest, booking, arraignment, pre-trial, trial, and appeal. After an arrest, the individual is usually booked at the police station. During the booking process, the person undergoes fingerprinting, questioning, searches, and photographs. All property on an individual may be confiscated, recorded, and stored at the police station. This can be an intimidating process. The person may be battered by police to confess to a crime. The individual may not realize the person could have an attorney present or remain silent. Discussing case details with anyone but a criminal defense attorney is not advised because any other person can be summoned to testify against a defendant. The Maryland teen’s own father may not be trusted since he already told reporters his son committed the shooting. 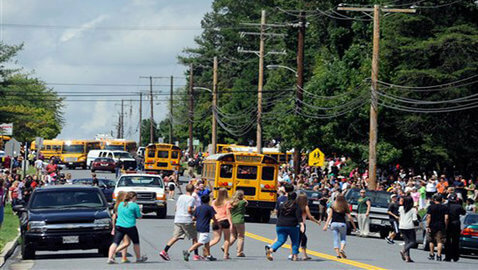 Baltimore County Police Chief said the teen went to school with a disassembled shotgun and 21 rounds of ammunition. Law enforcement reported the shotgun was more than 40 years old. After the arrest stage, the next stage is arraignment, where the accused is read the charges. If the accused does not have an attorney and is indigent, a court may appoint a public defender. At the arraignment, the accused may offer a plea. At pre-trial, the prosecution and the defendant’s attorney get together with the judge to discuss any settlement, and the formalities of trial. After trial, a criminal defendant has a chance at overturning a conviction with an appeal.